Blue mistflower, photographed at West Delray Regional Park, Delray Beach, Palm Beach County, in May 2014. Purple or blue? You decide. To most authoritative sources, such as the United States Department Agriculture, Conoclinium coelestinum is known as blue mistflower. Some, however, look at the whispy flowers and see purple. 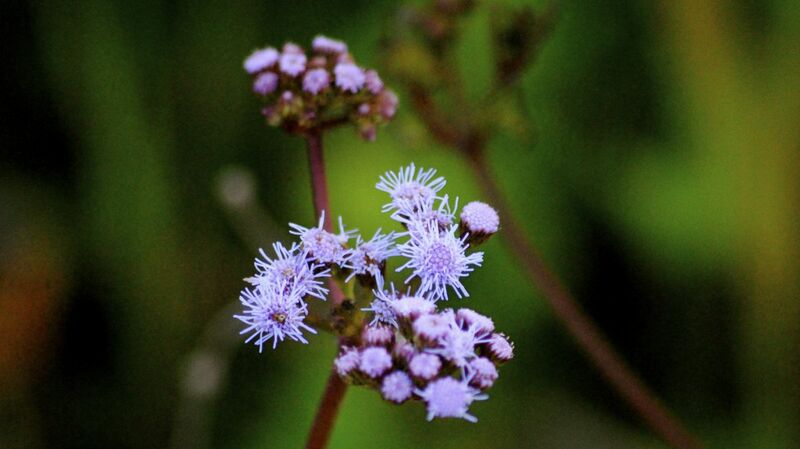 To them, this is purple mistflower, or purple ageratum. Same plant, just a different shade. And no matter which color you see, you're looking at a Florida native found in 64 of the state's 67 counties. It's a member of Asteracee, the aster family. And it is a magnet for butterflies, particularly skippers, including the obscure skipper (which is a lot more common than the name lets on), that are drawn to it by its nectar. It also attracts honey bees and beneficial insects. Blue mistflower's native range extends as far north as New York (although there are claims that it's an escapee from cultivation that far north), west into the Central Plains and throughout the Southeast United States. There's also a naturalized population in Ontario. It is a perennial that blooms in summer and fall, the flowers attractive enough for use in the garden. Blue mistflower's leaves are triangular and hairy, with blunted teeth along the edges. They also have a rough texture to the them. The leaves grow opposite each other along the stem. Blue mistflower is similar in appearance to ageratum, a cultivated plant from Central and South America, so much so that it's commonly called variations of ageratum. The flowers are also similar to joe-pye weed, a Florida native, but our guy is much shorter. Depending on which source you read, blue mistflower tops out at two feet or three feet, usually taller than it is broad. The plants we've seen generally would fall between one and two feet. It spreads via underground stems called rhizomes and can form large colonies. It will also spread vigorously via seeds. It likes wet or moist soil (but is adaptable to different soil types) and is found along the edges of woodlands, swamps and marshes in full or part-sun. It is cultivated for use in natural landscapes and restorations, in borders, as a ground cover and in wet and butterfly gardens. It grows rapidly but can get weedy and displace other plants. 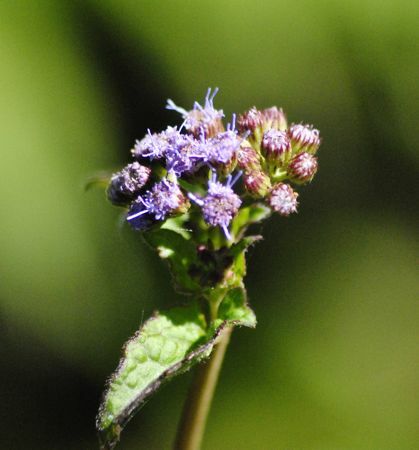 Other names include wild ageratum, hardy ageratum, mistflower, pink eupatorium and blue boneset. The last name comes from its former inclusion in a genus of plants called Eupatorium, some of which were used to treat dengue fever, also known as break-bone fever. 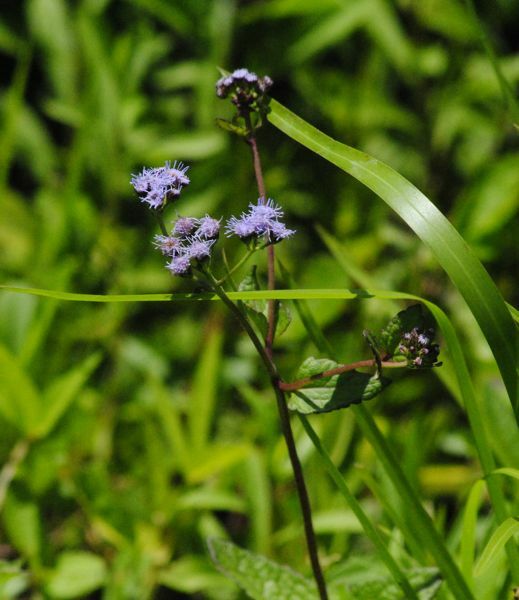 To our knowledge, however, blue mistflower has little or no use in traditional medicine.